Teachers participate in a hands-on science activity as part of the 2017-2018 JSAT Program. Science enrichment program helps teachers hone skills and earn recertification points. NEWPORT NEWS, VA – The U.S. Department of Energy's Thomas Jefferson National Accelerator Facility is accepting applications for its 2018-19 science enrichment program for fifth-, sixth- and eighth-grade teachers of science. 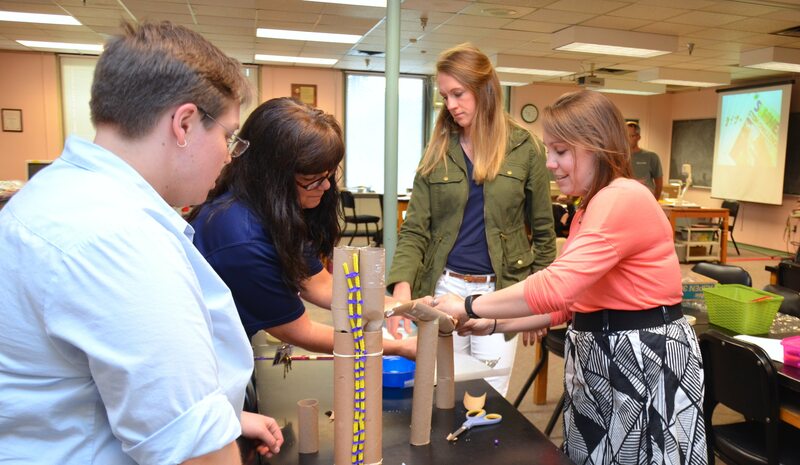 The Jefferson Lab Science Activities for Teachers program is designed to increase teachers' knowledge of the physical sciences and to strengthen their teaching skills. The JSAT after-school program starts in September 2018 and continues through May 2019. It offers interactive activities to enhance physical science instruction at the upper-elementary and middle school levels. A wide range of topics will be addressed, including: matter, atomic structure, energy transfer, force and motion, magnetism and electricity, waves and sound, simple machines, optics and the watershed cycle. Program participants receive supplies and materials, so that they will be able to conduct all of the planned activities in their own classrooms. As a professional development opportunity, they also present an activity at the Region II Jefferson Lab Teacher Night. Participating teachers can earn a stipend and up to 48 recertification points for 2018-19. The JSAT program, funded over the past 10 years by a grant from the Jefferson Science Associates Initiatives Fund, addresses components of National Science Education Standards and the Virginia Standards of Learning. Fifth-grade teachers will meet on alternating Thursday evenings, sixth-grade teachers will meet on alternating Tuesdays, and eighth-grade teachers will meet on alternating Wednesdays. Sessions will take place from 5-7 p.m. at Jefferson Lab, located at 12000 Jefferson Ave. in Newport News. Additional information about the program and the application form is available at: http://education.jlab.org/jsat/index.html. Questions may be directed to Surles-Law at surles@jlab.org or 757-269-5002. The application deadline for the 2018-19 program is Friday, Sept. 7, 2018. The JSA Initiatives Fund Program was established by Jefferson Science Associates to support programs, initiatives and activities that further the scientific outreach, and promote the science, education and technology missions of Jefferson Lab in ways that complement its basic and applied research focus. Initiatives Fund awards are for those projects that benefit the lab user community and that leverage commitments of others. Information about the JSA Initiatives Fund is online at: http://www.jsallc.org/IF/IFIndex.html.